The Viña Ijalba Winery offers high quality products and operates with a high level of environmental awareness. In 2011 environmental contractor HIDECO (Hidráulica Depuración y Ecología, SL) installed a membrane bioreactor (MBR) incorporating an Alfa Laval membrane filtration module (MFM) for biological wastewater treatment. This not only enables Viña Ijalba to release treated wastewater legally and safely into the nearby river, it also gives the winery the possibility to re-use the water for irrigation when necessary. A traditional winery located in Spain’s famous La Rioja wine region, Viña Ijalba is setting the standard for environmental awareness in and around Rioja – from its organic production to its extensive re-cycling and environmental certification. Wine making requires large amounts of clean water for washing newly harvested grapes as well as equipment and facilities. However, the Viña Ijalba winery does not have a municipal sewage treatment facility nearby in the Logroño area. Therefore, to be allowed to discharge wastewater into the river near the plant it was necessary to treat it first to comply with the new, stricter local environmental regulations relating to effluent discharge. The winery was looking for a completely reliable, simple to operate and maintain wastewater treatment solution capable of coping with seasonal load variations. Since the winemaking process varies from day-to-day, the solution also had to be able to handle variations in both load and composition of the raw wastewater. 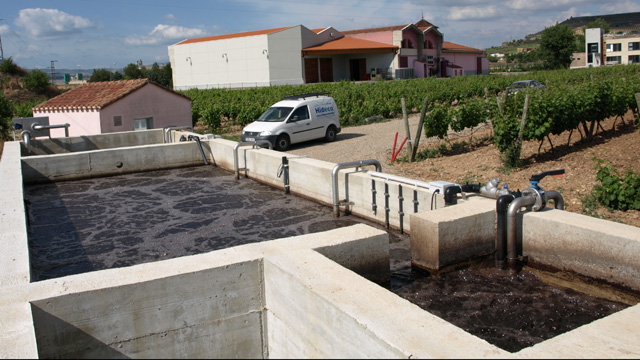 Viña Ijalba consulted HIDECO (Hidráulica Depuración y Ecologia, SL, an environmental contractor well-known in the Rioja area, specialized in the design of MBR wastewater treatment plants for wineries. The company recommended an MBR plant based around an Alfa Laval membrane filtration module (MFM) of the patented hollow sheet technology that combines the best features from the flat sheet and hollow fibre membrane technologies. It is also more compact than a conventional wastewater treatment plant, and the final effluent is of reuse quality. Hideco has been a local Alfa Laval partner for several years, designing and installing decanters for industrial sludge treatment as well as incorporating Alfa Laval MFM’s in a number of MBR, primarily wineries. Felipe García Chivite, Managing Director of HIDECO, explains that his company’s choice of membranes for its MBR plants is based on an earlier research and pilot project. One aspect of this project involved comparing different filtration membranes to determine the best solution for treating wine industry effluents. They chose the Alfa Laval hollow sheet type membrane module. The MBR effluent treatment system incorporating the Alfa Laval MFM 100 unit was installed by Hideco at Viña Ijalba in 2011 and has a capacity of 35-40 m3/d. Alfa Laval contributed with technical know-how and support during the design, installation and commissioning. According to the winery, the MBR system’s performance has lived up to and surpassed expectations (see table). As specified, the quality of the treated water allows it to be discharged into the river, or used for irrigation if desired. In the low season, when the need for wastewater treatment is much less, the winery reduces flux or stops the filtration for a number of hours, or even days, if necessary. and for chemical cleaning was also a contributing factor for the selection of Alfa Laval membrane modules for Viña Ijalba. Thanks to the gravity operated Alfa Laval MFM module, the system has fewer pumps and a simpler control system than other technologies. Since there is less equipment, maintenance requirements are lower. However, Alfa Laval is always on hand locally to provide the the plant operator with service, maintenance and technical assistance on the MFM unit if needed. The key factor with the hollow sheet membrane is the low pressure needed for filtration. This results in important advantages. The all-in-one Alfa Laval Membrane bioreactor (MBR) system combines secondary and tertiary wastewater treatment and delivers a superior effluent quality (effective filtration in sludge to 0.01 µm) suitable for reuse.